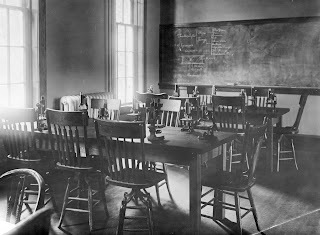 Neville Hall after it was first built. The New Dormitory, the second building added to the original three buildings, was constructed in 1890 at a cost of $14,500. It was remodeled for classes in 1918 due to a report in June of 1917 that described the New Dormitory and the Old Dormitory as "public nuisances." 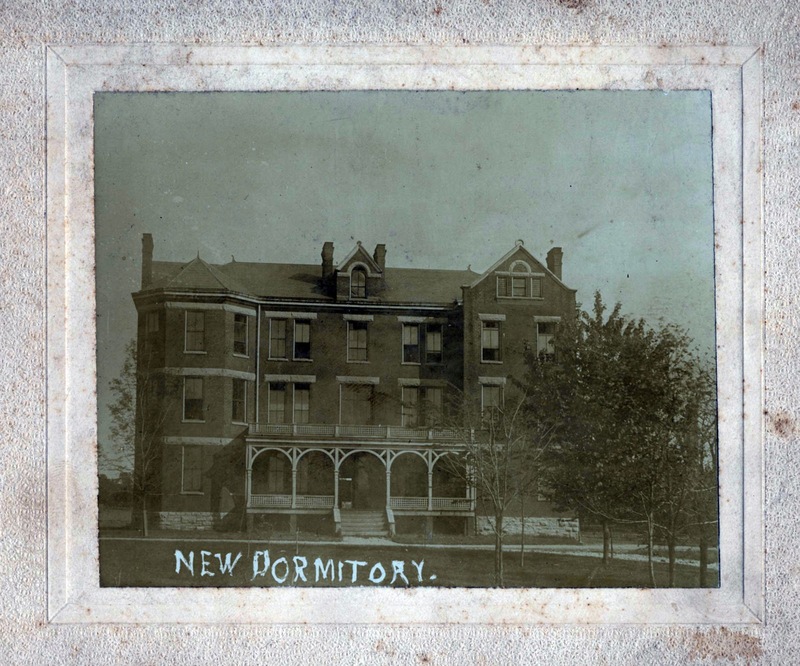 On December 18, 1919, the Board of Trustees followed a recommendation of President McVey and the building known as the New Dormitory was named Neville Hall in honor of Professor J. H. Neville who was for many years professor of Latin and Greek and for a time served as Vice-President. In the 1930s, the building housed the departments of Hygiene, Psychology, and the Dispensary. The building deteriorated over the years and in 1937 the Board of Trustees recommended that the building be abandoned and again in 1942. 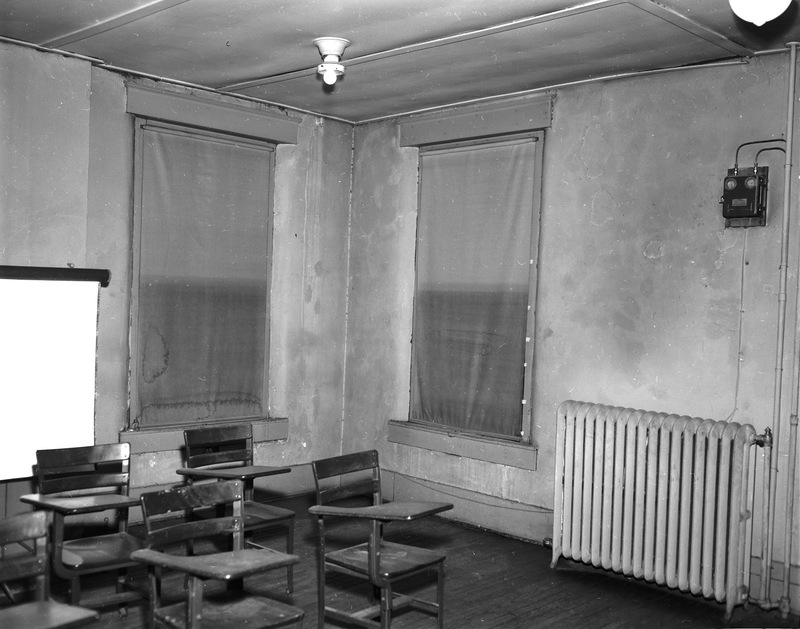 By 1955, the building was still in use, housing the Department of Psychology. At that point the south wall bulged three to five inches out of line. 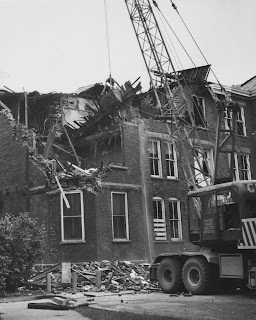 Classes were being held on the third floor and while there was no immediate danger of the building collapsing, the brickwork was rotten, wood infested with termites, plaster was loose, wiring in dangerous condition, and lighting and plumbing were obsolete. Frank D. Peterson, the University comptroller condemned the third floor. Despite this, use of the building continued as there was no other space for the Department of Psychology. On January 9, 1961 fire swept through the 71 year old Neville Hall. Seventy students and 10 faculty members were in the building and all got out safely. The wood of the building burned away along with the research of many psychology graduate students. The building was so badly damaged by the fire that destruction was necessary. It was the first serious fire since the 1956 fire at Frazee Hall (Education Building). 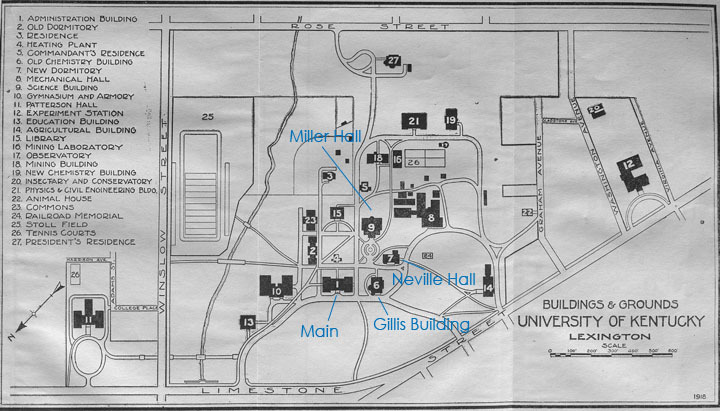 After Neville Hall was demolished, the land was used for a parking area and lawn. 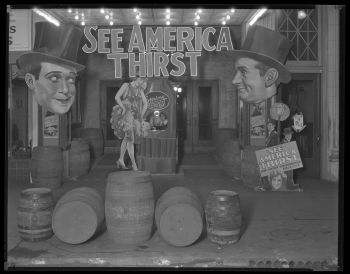 Friday brought the launch of the much-anticipated Digital Public Library of America (DPLA). 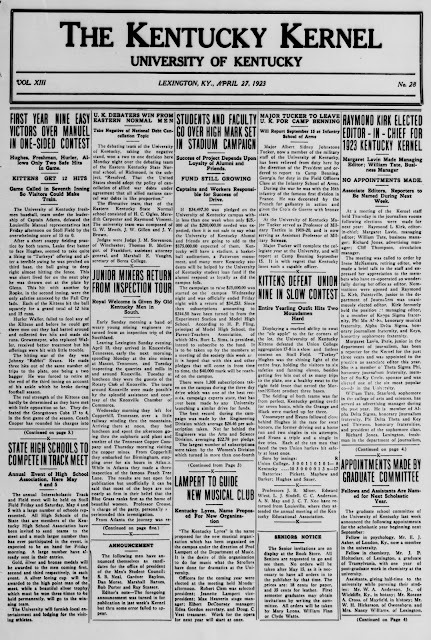 Digital objects from a number of repositories across the country, including the University of Kentucky Special Collections, are now searchable via a single portal. DP.LA also hosts several exhibits featuring materials from the six service hubs. Topics include activism, the Great Depression and New Deal, and national parks. 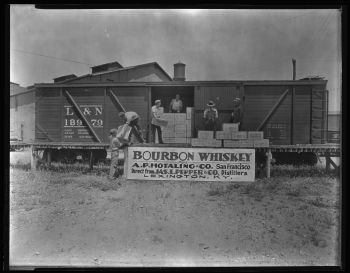 University of Kentucky Libraries faculty and staff collaborated on Indomitable Spirits: Prohibition in the United States, which spotlights images, documents, oral histories, and newspapers from UK Special Collections. The William T. Young Library is full of treasures. Among those is the tapestry of William T. Young and his stallion, Storm Cat on Overbrook Farm. In the fall of 1999, architect Michael McKinnell approached Helena Hernmarck to design and weave a tapestry for the Library. The tapestry was woven on a 12-foot Swedish rug loom over the course of nine months. Over seven hundred colors were used in the tapestry and its final weight is approximately 200 pounds. The tapestry is monumental and a beautiful narrative of Kentucky pride and history. Helena Hernmarck is a Swedish-born textile artist whose work is in the collections of the Museum of Modern Art and the Metropolitan Museum of Art in New York, the National Museum of American Art in Washington, D.C. and the Los Angeles County Museum of Art. 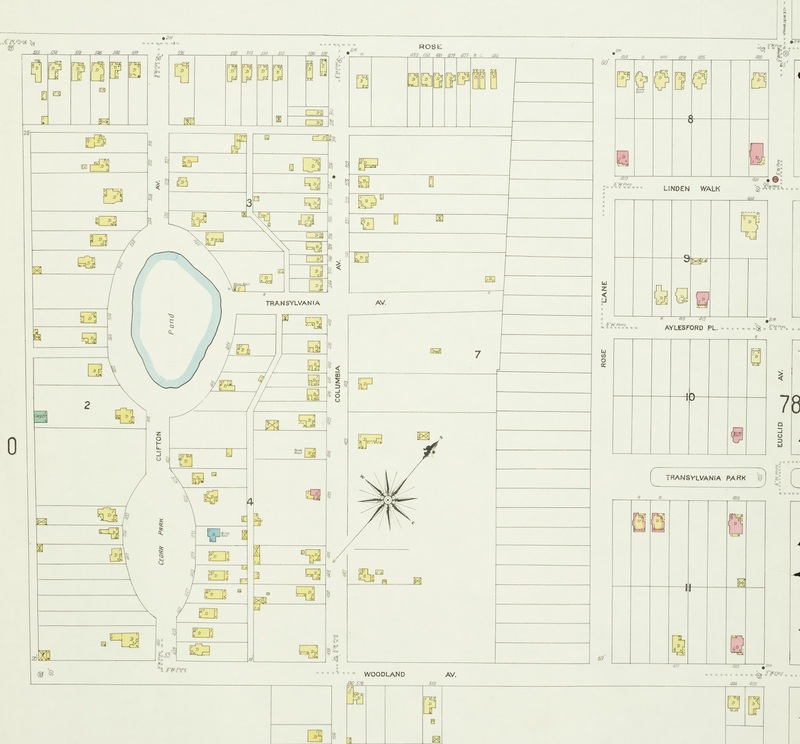 Overbrook Farm was founded by Lexington native, William T. Young, whose initial gift began the capital campaign that raised money for the William T. Young Library which opened in April 1998. Mr. Young began acquiring his foundation broodmares for Overbrook Farm in the early 1980s. The most notable of these was Terlingua, a daughter of champion Secretariat, who was bred to Storm Bird, a son of Northern Dancer -- a mating which produced the legendary Storm Cat. 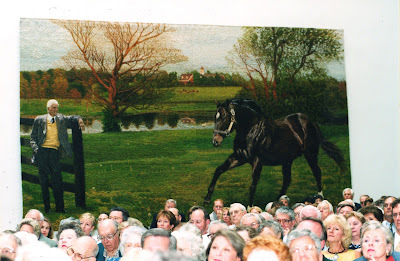 Through 2001, the year that the tapestry was commissioned, Storm Cat had been North America’s leading sire by earnings for two years (1999 and 2000) and had been leading sire of two year olds five times. At the time, Storm Cat was by far the highest priced stallion in the world, commanding a stud fee of $500,000. On February 27, 2013, Storm Cat enjoyed his 30th birthday but due to complications from old age, was euthanized on April 24, 2013. He is buried on Overbrook Farm. 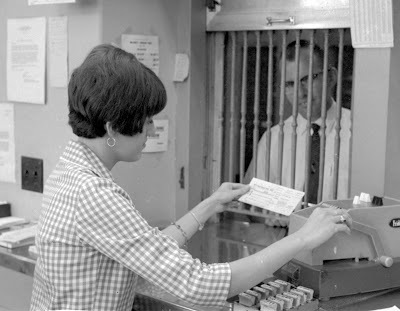 Suzanne E. Hudson working in the Lexington Post Office in September 1966. 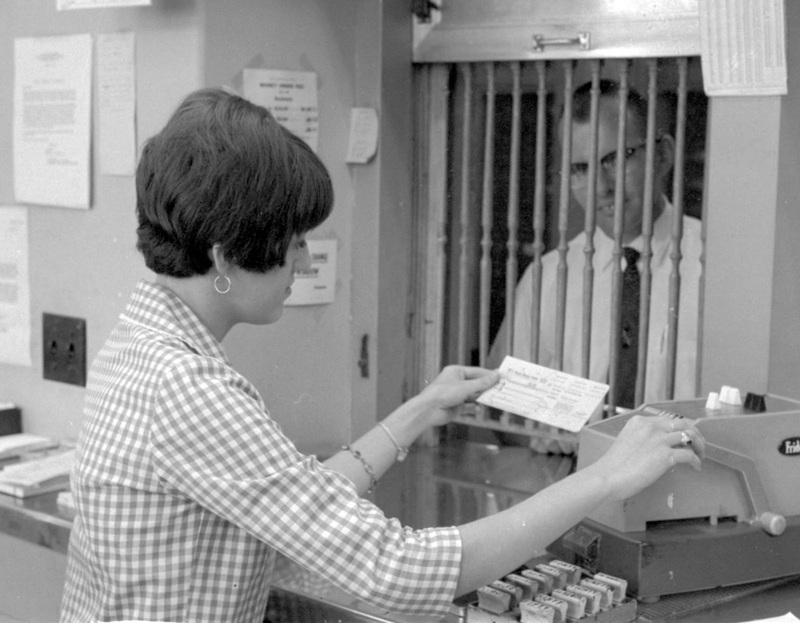 Hudson became the first female window clerk to work at the Lexington Post Office since 1952. 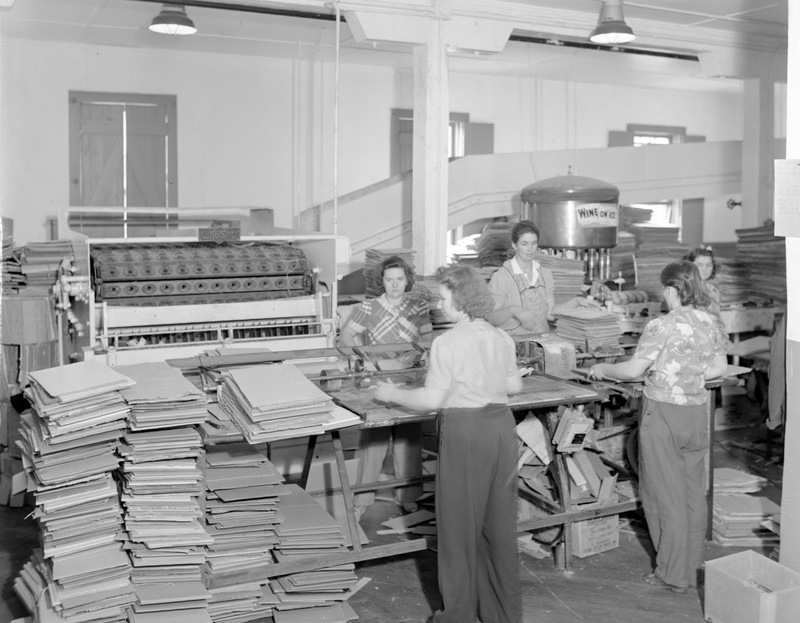 She was among 27 women employees, including two carriers, several clerks, stenographers, and secretaries. 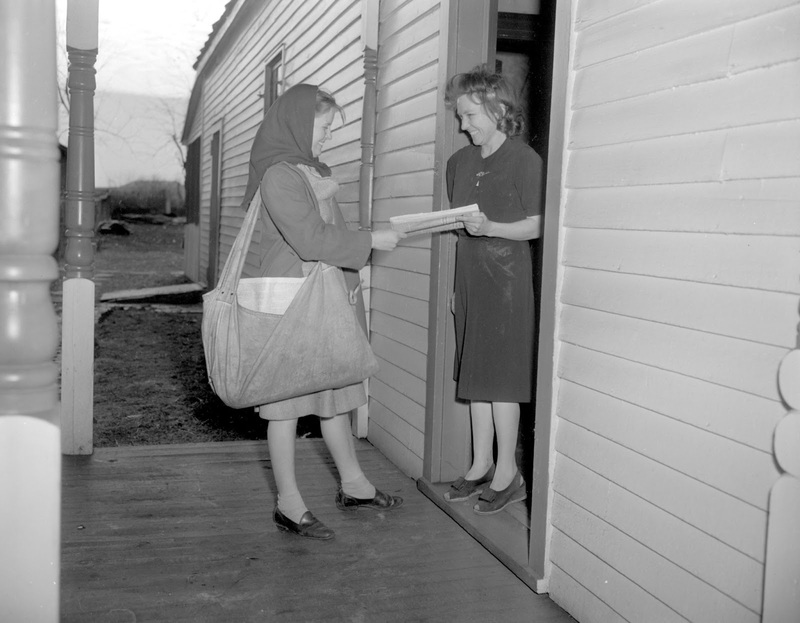 In 1960, there were only six women with the post office. 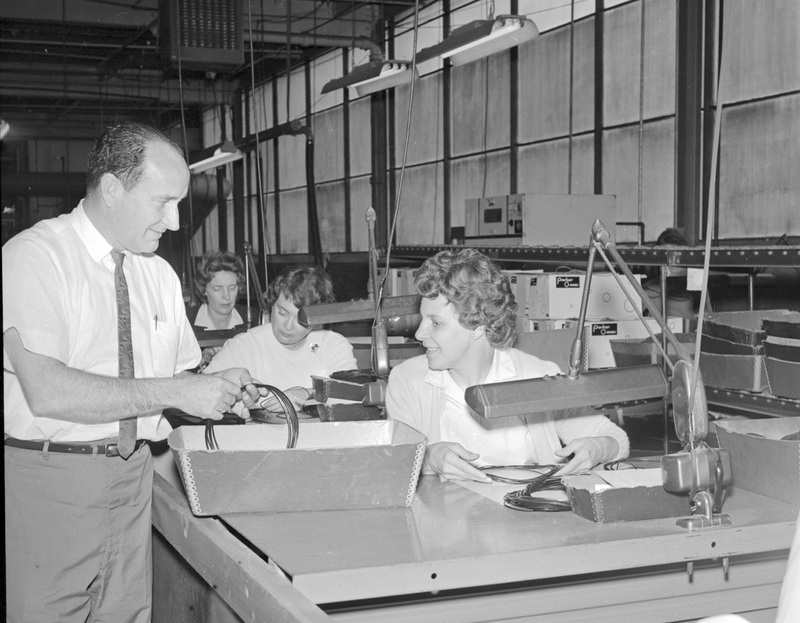 Ed Reinsch, production superintendent, and Alice Parida were employees in the Lexington Parker Seal Company in May 1964. Parida was one of 17 employees who started when the plant opened in 1959 and one of the 11 original employees to remain with the company. 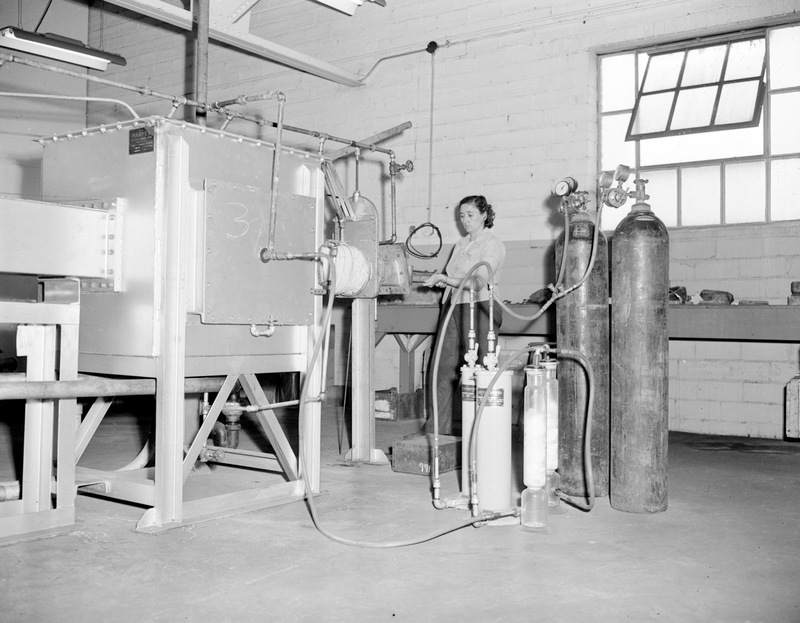 The Lexington Parker Seal Company made O-rings that were used in hydraulic and pneumatic systems. 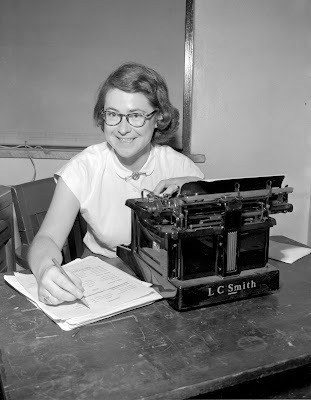 Janet Anderson, editor of the University of Kentucky Kernel was awarded the Fullbright scholarship for graduate study abroad and enrolled for a year’s graduate work in journalism at the University of Glasgow, Scotland,1951. 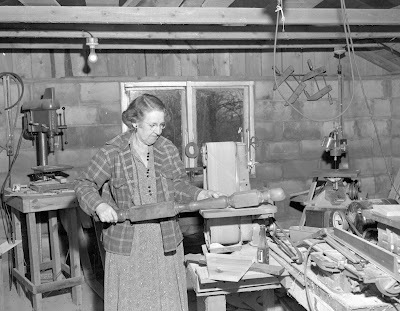 An unidentified woman operating a piece of equipment at the Archer and Smith Tool Company. 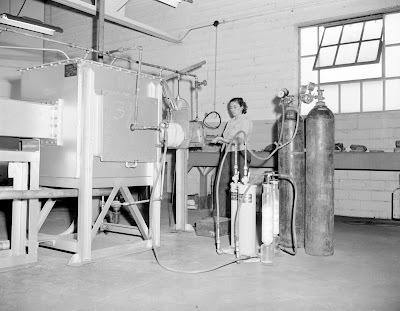 The company opened a new metallurgical laboratory in July 1945. Dr. Mary Jean Bowman was the only female member of the Social Science Research Council, a special committee formed to research business enterprises in the United States. She earned a bachelor of arts degree from Vassar and a doctorate from Harvard. Dr. 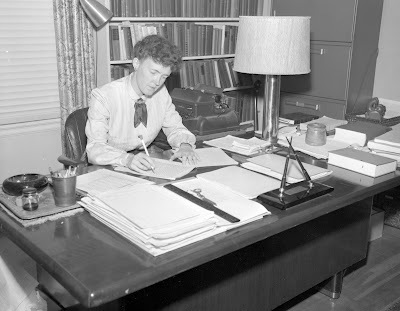 Bowman was an author and a teacher; she worked for the government and served on a national committee of the American Association of University Women, 1953. 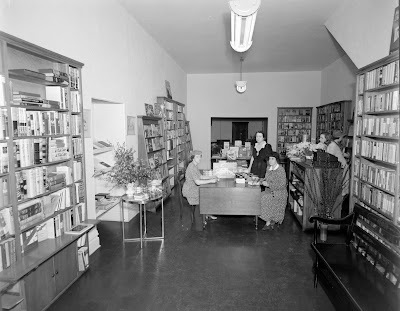 Women working at a book-signing event in the Morris Book Shop at 110 Market Street in April 1941. 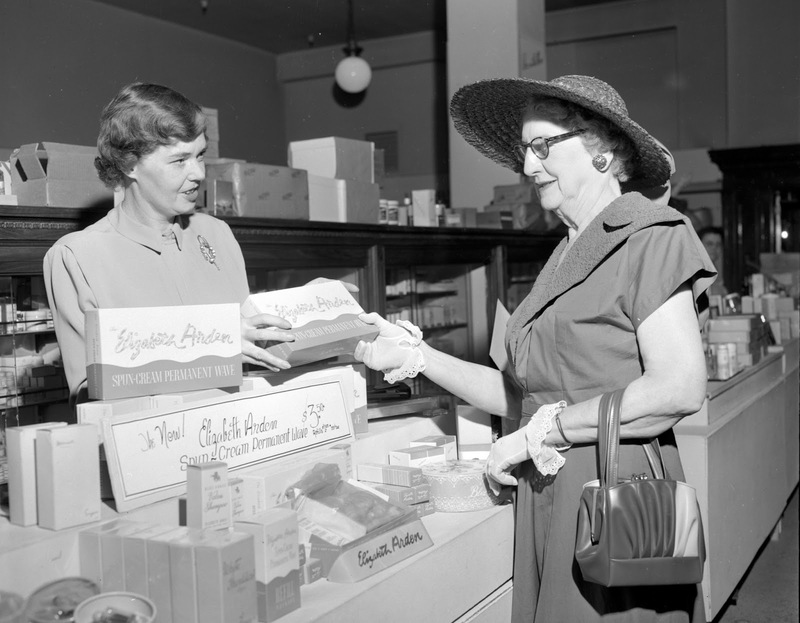 Mary Pilyer (left) handing a package to Mrs. Harold F. Johnson at Wolf-Wile’s store in May 1950. 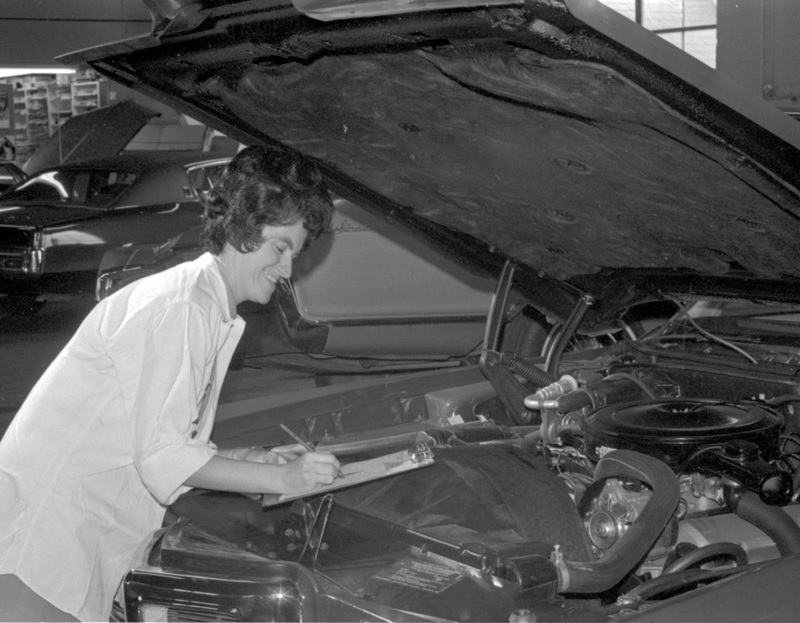 In 1968, Nelye Strong became Kentucky’s first female automobile inspector, breaking into a male-dominated field. She is working in the Charlie Sturgill Motor Company and was an experienced mechanic who at one pointed owned an interest in her own garage. 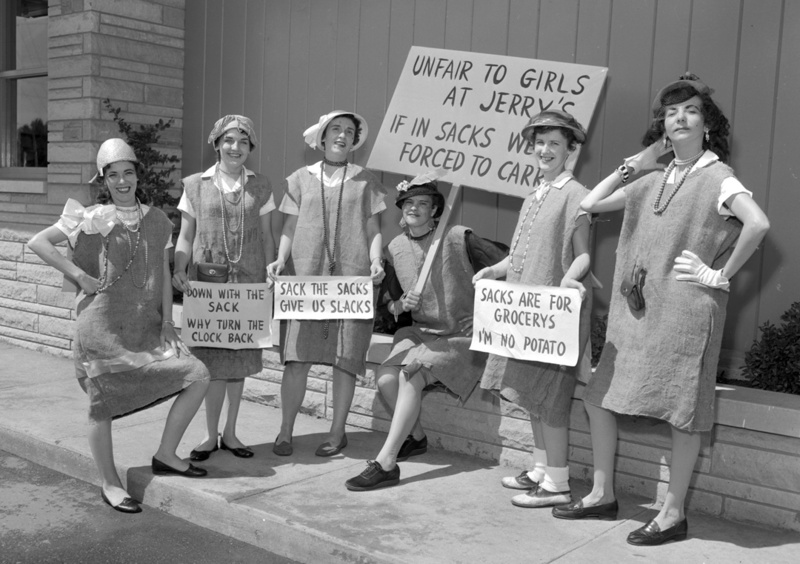 Waitresses at the Jerry’s Drive-In Restaurant registered a friendly protest after hearing a report that the company was ordering new chemise uniforms for all its waitresses. The women reported for work dressed in uniforms made of burlap sacks in May 1958. 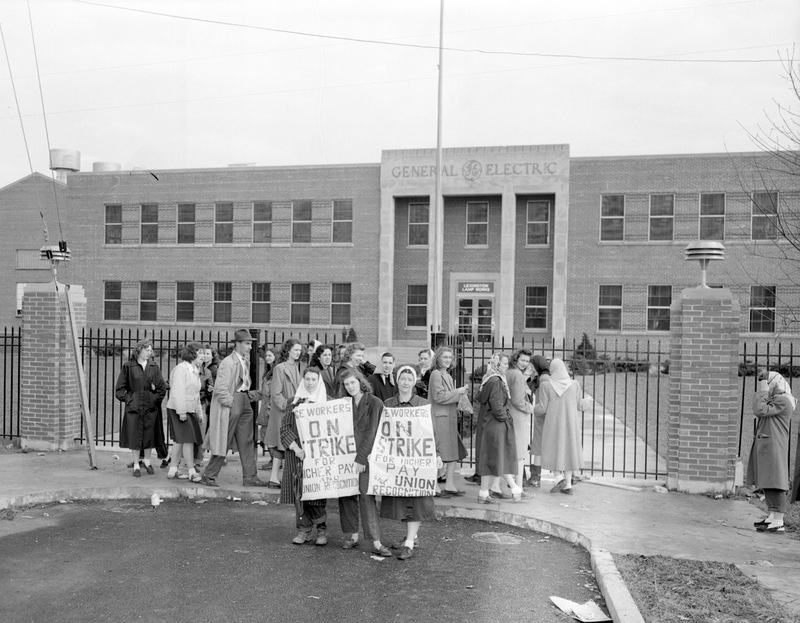 From left to right, Billie Columbia, Doris Jones, Melba Stevens, Florence Marshall, Sue Stafford, and Carol Lewis. 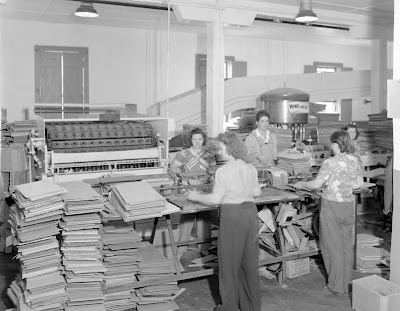 Women working on the assembly line at the National Distillers Corporation packing department in September 1944. 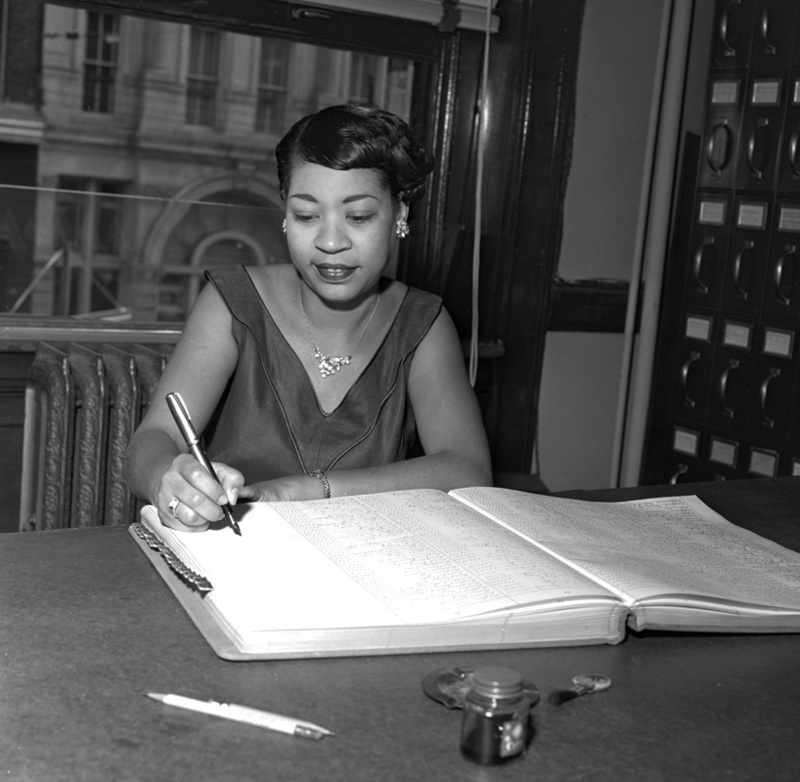 Georgia R. Bates, the first African American to be employed in the county clerk’s office, working in the Chattel Mortgage office in September 1955. Georgia was a graduate of Dunbar High School and attended West Virginia State College, where she studied business administration. Nancy Hendricks, 20, working in Good Samaritan emergency room in April 1946. Mrs. J. C. van Arsdell, an expert cabinetmaker, standing beside her belt sander in the concrete block workshop behind her home in April 1953. Some of her accomplishments include building four-poster beds, tables, and kitchen cabinets. 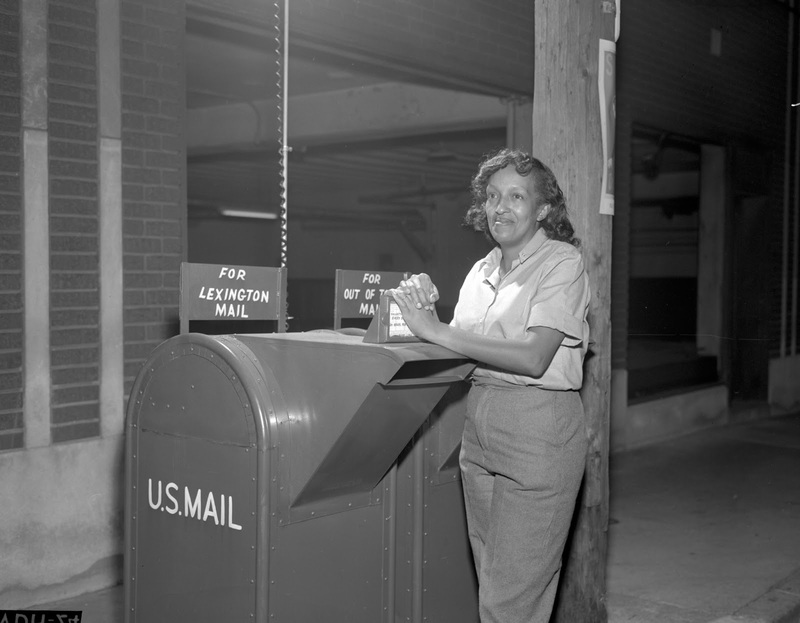 Ruby Flynn, named substitute city letter carrier for the Lexington Post Office, became the city’s first peacetime woman mail carrier in January 1963. Mrs. Flynn did civilian work with the Navy Department during World War II. 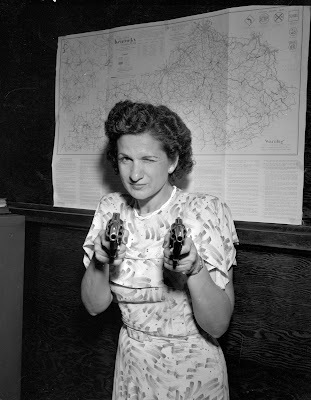 In February 1946, Ida Oplas was sworn into her post as Lexington policewoman. For most of her career, Ida worked with juveniles and checked the red-light district for runaways. In 1967, she was promoted to sergeant, becoming the first woman sergeant in Lexington. 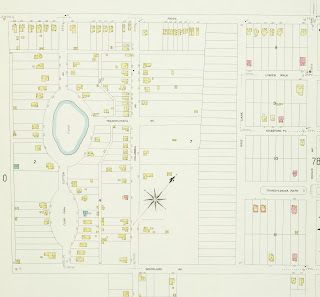 In July 1949, Oplas shot a perfect score on the seven-yard straight course. An unidentified woman tending tobacco in a Lexington field around 1940. 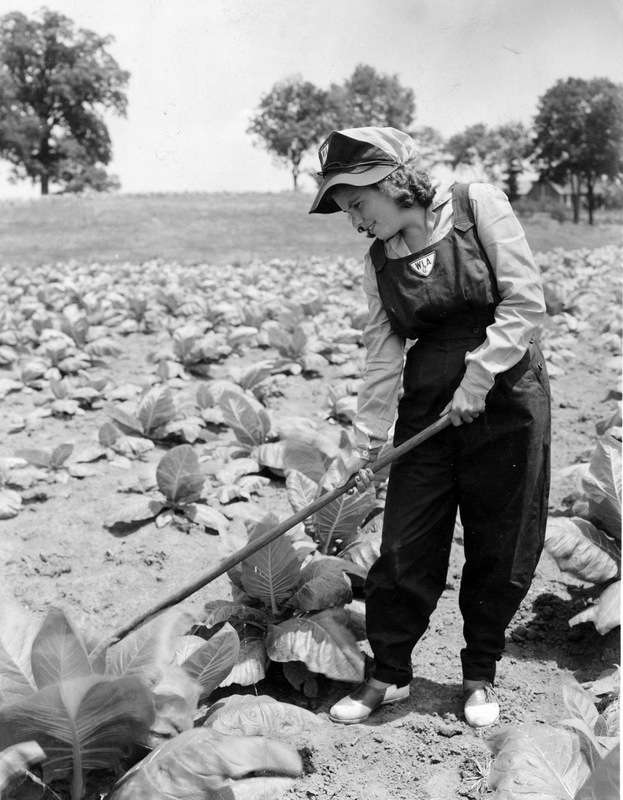 She is wearing a hat and overalls with the Women’s Land Army emblem. 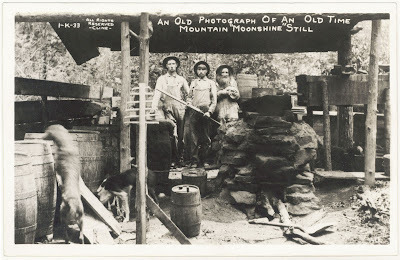 The WLA was a national effort to supply laborers to farms in the United States. 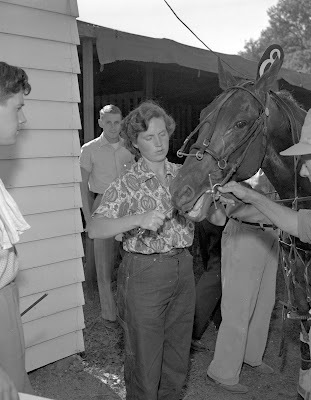 Dr. Jeanette Sams, track veterinarian, performing a saliva test on a horse in 1952. She graduated from Cornell and served as track veterinarian at Fairgrounds Speedway in Louisville for four years. 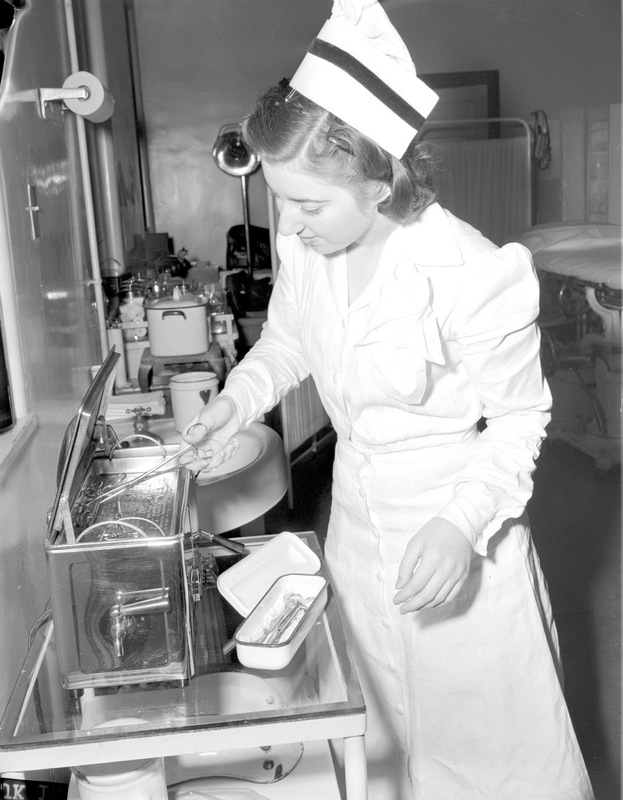 Dr. Sams was the first woman to be a track veterinarian at the Lexington Trots. At a strike at the Rosemont Garden plant of General Electric, women are holding picket signs protesting for higher pay and union recognition in March 1948. 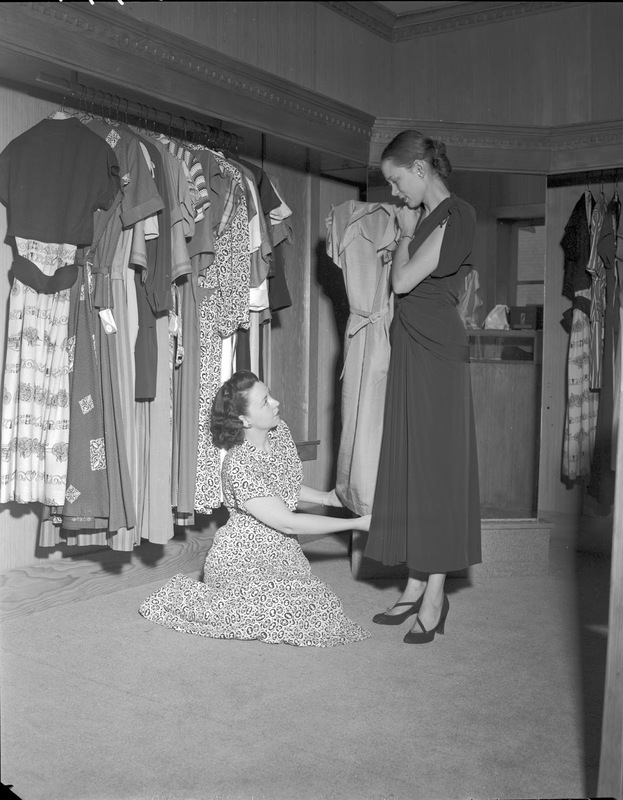 Donna Haynes (right), the proprietor of the Tall Shop at 115 East High Street, with her associate, Gene Ray Bunnell in July 1949. 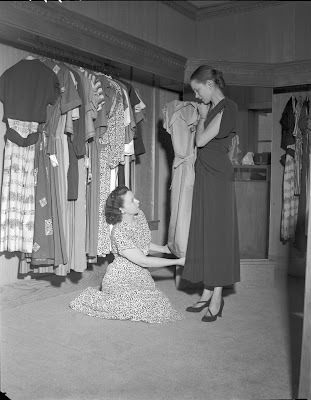 The Lexington specialty shop sold long dresses for tall girls. Haynes said in regards to the clothing and her own tall stature, “the current doctrine is not to try to disguise a tall girl’s height, but to take advantage of it." Geneva Bishop, the first female carrier for The Leader, delivers papers in Irishtown in 1945. 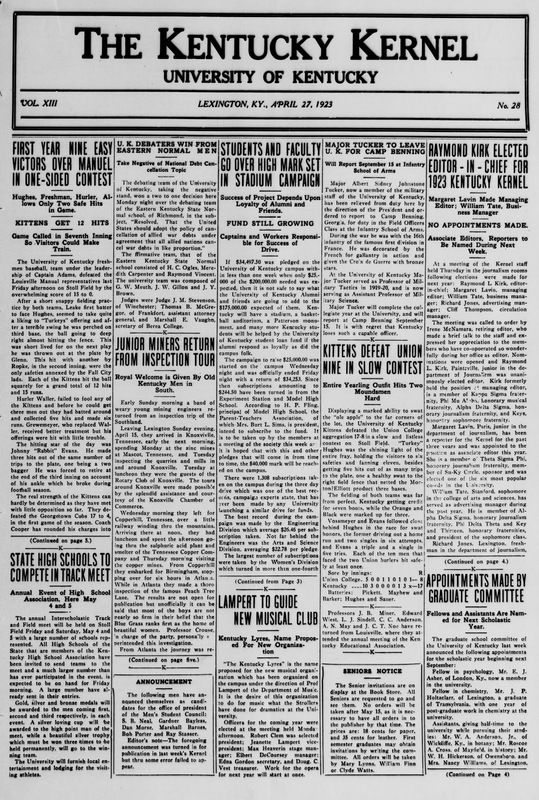 In the early 1900s, State College, as UK was then known, had a total enrollment in the 700s, tuition was free to all residents of the state of Kentucky, and the physical boundaries of the core campus were Rose Street, Graham Avenue, Limestone Street, and Winslow (now Avenue of the Champions). 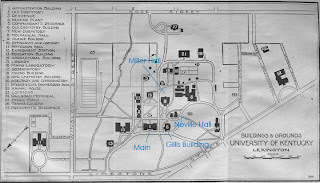 Three buildings were outside those bounds: The Department of Agriculture (now Scovell Hall); a greenhouse; and Patterson Hall – constructed a far distance from main campus to keep the women students isolated from the men. Despite the trouble, traditions were being formed and a campus culture was evolving – perhaps too slowly for some. With a freshman class of around 150 it was easy for everyone to get to know one another. 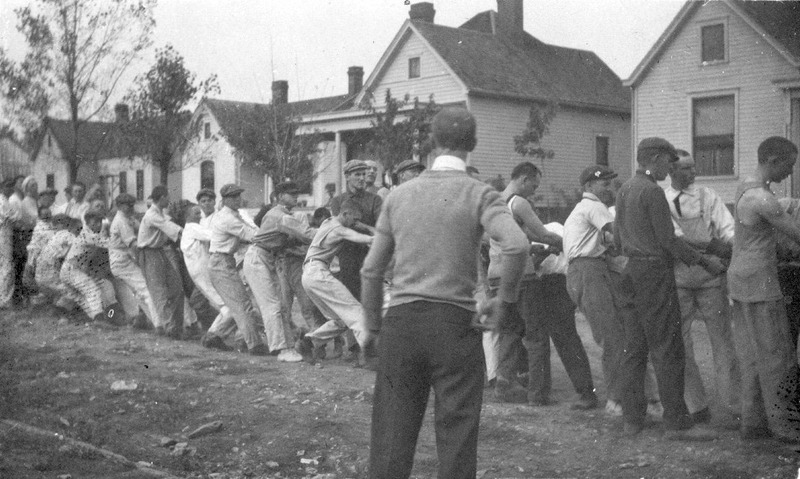 The classes moved forward together toward their collective graduation year and class rivalries were quite popular. There was the annual flag rush, hand painting class graduation years in outlandish locations, mock funerals, bucking the corduroys, sophomore freshman football games, and the freshman sophomore tug of war. The present site of Young Library was the Clifton neighborhood complete with Clifton Pond – the site of the annual battle. With the firing of a gun, the tug of war would begin. 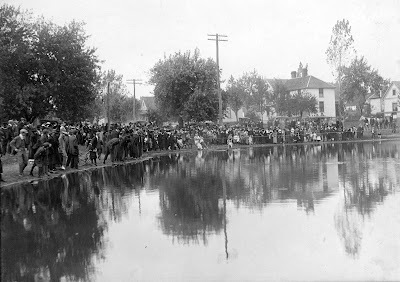 The massive steel cable that they used would slowly become taut across the pond with one class pulling towards Rose Street. 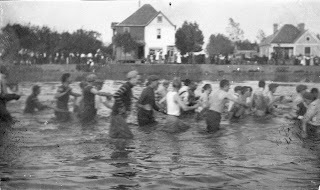 The competitors all dressed in bathing suits and old clothes in anticipation of losing the battle. After the losing class was pulled into to the pond (usually the sophomores), the victors would march to Main Street to announce their victory to the town – shrieking and yelling the entire way.